It's hard to think that human history would've been the same if we didn't have horses. From the talented riders on the Steppes of Mongolia to the rugged Gauchos of Argentina and the cowboys of the Wild West, horses have been intricately interwoven into our daily lives. Ever since its introduction in the early 18th century by the Europeans, horses have become the focal point of the plains tribes. Horses made everything easier, from hunting buffalo to moving villages. Native Americans made good use of the new 'technology' and became renown horse riders. The noble exploits of the Native Americans Chief Blue Horse and Chief Crazy Horse have become legendary in the Lakota Nation. Even today, it's hard to imagine Native American culture without the Horse. Without horses, much of the American continent would not have been colonized. From wagon trails to bold cowboys, the Wild West was won on horseback. The Horse still remains a central figure on the Great Plains. The fact that the power of the most modern cars is measured in Horsepower is no coincidence and is a tradition that pays homage to the great American expansion. These animals have played a pivotal role in numerous wars. Genghis Khan wouldn't have been able to establish and rule his empire without his army of magnificent riders. The Egyptians destroyed their enemies while riding horse-drawn chariots and the Knights Templar charged through the Crusades atop fearsome stallions. The colour of the horse is also of significance. It's no accident that fairytales are filled with stories about the adventures of knights riding to the rescue of a damsel in distress on A white horse. A white horse is also believed to be the reincarnation of the Hindu god Vishnu and in many folklore traditions, a black horse is seen as a bad omen. Even our language has been influenced by our love of horses. There are numerous proverbs and adages that refer to horses. Have you ever felt like you've been 'flogging a dead horse' when trying to overcome an obstacle is proving futile? And who can forget countless childhood birthdays spent riding a carousel horse on Merry-go-round? 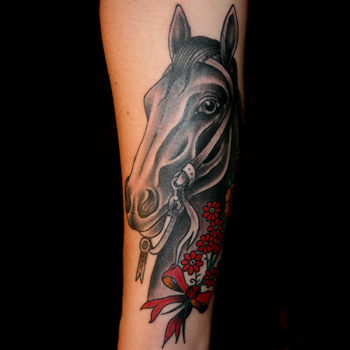 Whether you want a horse tattoo that pays homage to your native culture or one that signifies your spiritual connection to the animal, there are many elements that can be incorporated into your tattoo design. Epona, the Celtic goddess of Fertility, was charged with the duty of protecting horses, mules, and donkeys. In this culture, horses also represent the Spoils of War and Victory. Additionally, the Celts associated these animals with the sun god, bestowing on the animal Honour and Power. Getting a Celtic Horse Tattoo is a great way to identify this culture and the power of that these magnificent creatures symbolize. Tribal Tattoo designs originate from various regions and cultures across the globe. Most Tribal Horse Tattoos have Native American or South American influences and represent your spiritual connection with these creatures and the respective culture. The designs are usually drawn to symbolize the animal's Power and Strength. The most famous winged horse, Pegasus, sprang up from Medusa's blood after Perseus beheaded her. Pegasus grew to become a legend after paying homage to Zeus and was charged with the task of bringing lightning and thunder to Earth from Olympus. After being captured by the hero Bellerophon, the duo then took on countless adventures, including slaying the Chimera and fighting the Amazons. Pegasus is also associated with the Muses, as such, Winged Horse Tattoos represent the freedom of ideas, thoughts, and Creativity. In a sense, Pegasus gives wings to mankind's ideas. If you don't have the luck of the Irish, then try creating your own with a horse shoe. The tradition of associating worn-out, discarded horse shoes with Prosperity and Luck began in Europe and was spread throughout the world by European immigrants. The position of the shoe is also of significance. In Northern Europe (Ireland and England), the horse shoe must be pointed upwards, whereas in southern countries, the shoe will only bring luck if its ends point down. Most persons wearing a Horse Shoe Tattoo do so to signify their desire for a change of fortune. If ever there was a symbol that adequately depicted the untameable nature of a horse, a Flaming Horse Tattoo would be it. Flaming Horse designs link the strength of the horse with the power of the natural element, Fire. This design is truly for those free-willed individuals who associate with the strength and uncontrollable power of a wild horse. When you think of a race horse, the majestic breed known as the Arabian thoroughbred easily comes to mind. They are among the top ten most popular breeds and have dominated the equestrian world for generations. Getting an image of a race horse tattooed on your body is a way to symbolize your link with the Speed, Agility, Beauty, and Power of a running horse. The design also represents your need to be free to make your own choices. Choosing the right design is tricky and involves trying to juggle several decisions simultaneously. What will your new piece symbolize, where will it be placed on your body, and what other elements will you add to the design? If you need some inspiration, our team can design a truly unique piece for you. Simply visit our design page at www.itattoodesigns.com and take advantage of our Custom Service.